The official South African Police Service (SAPS) crime statistics for the 2013-14 financial year reflect the heavy burden crime places on business. The statistics show a 13,7% increase in robberies at business premises from the previous year, and an overall increase of 461% since 2004-05. In 2004-05, 3 320 cases of business robberies were reported to the police, compared with 18 615 cases reported in 2013-14. One form of business robbery that is currently particularly disturbing, especially in the run-up to the 2014 festive season, is armed robberies at shopping malls. Well-organised gangs of four to five heavily armed criminals attack shops trading in goods such as jewellery, IT equipment, cellphones and even exclusive clothing. According to the Consumer Goods Risk Initiative (CGRI), in the three financial years up to 2013-14, armed robberies at shopping malls showed a staggering increase from 274 to 665 (142%). Armed robbery – or robbery with aggravating circumstances, as it is officially known – represents a particularly feared form of violent crime as it usually is associated with severe trauma or injury to victims, and sometimes even death. Consequently, and with the festive season approaching, there is understandable concern about safety from the public. Tourists are equally worried: the Institute for Security Studies regularly receives enquiries from abroad about the risks of visiting and shopping in South Africa. Bank robberies, on the other hand, have been decreasing since 2007-08, when 144 incidents were recorded. In 2012-13 only seven bank robberies were reported. This is quite an achievement considering that in 1996-97 bank robberies in South Africa peaked at 561. It is therefore of concern that there was a renewed increase in bank robberies in 2013-14 from seven to 21. Cash-in-transit robberies have remained unchanged in the last two financial years, with 145 recorded both in 2013-14 and in 2012-13. It is however worrying that the downward trend in this crime type had been halted for the first time in seven years, considering the overall year-on-year drop of almost 70% since 2006-07. The number of business-related burglaries increased by 5% between 2011-12 and 2012-13, as 3 589 more businesses were targeted. This crime remained largely unchanged in the past year as 73 600 businesses reported this form of property crime, compared to 73 630 in 2012-2013. Cable theft is a further concern to business. It places a burden on companies as it often leads to protracted power outages, which leads to a loss of productivity, among other things. This particular statistic is hidden in a general catch-all crime category named ‘all theft not mentioned elsewhere’. In 2012, former police minister Nathi Mthethwa estimated that cable theft costs South Africa approximately R5bn a year, but other sources have placed this figure at closer to R10bn a year. Productivity and growth are put under further pressure by increased social unrest and strikes. For example, the South African Police Service (SAPS) reports that although the overall number of crowd-related incidents remained fairly stable at approximately 12 000 to 13 000 per year over the last four years, incidents that turned violent increased by 96%, from 971 in 2010-11 to 1 907 in 2013-14: that is, five incidents per day. There are also other indicators that reveal the effects of crime, or the fear of crime, on business growth and development. For example, surveys conducted among the business community and published in the Grant Thornton International Business Report (IBR), shows the worrying changes in crime trends affecting business. In 2007, 84% of the respondents indicated that they, their staff or families had experienced some form of serious crime. By 2011 this figure dropped to 46%, but thereafter increased year on year to 65% for the first six months in 2014. In 2014, 74% of business executives noted the increased cost of security as their biggest burden. In 2011 it was 45%. In 2014, 37% said that the threat of crime resulted in decreased motivation. In 2011 it was 16%. In 2014, 37% indicated that the threat of crime led to decreased productivity. In 2011 it was 15%. In 2014, 20% indicated that the threat of crime led to a loss of staff. In 2011 it was 9%. Not unlike violent and property-related crimes, high levels of commercial crime and corruption pose a serious risk to both the South African business community and the national economy. The broad category of ‘commercial crime’, which includes all kinds of corruption, fraud, money laundering, embezzlement, forgery, and so forth, has increased by a substantial 70% in the past decade. The latest statistics reveal a relatively small decrease of 13,7% from 91 569 in 2012-13, to 79 109 incidents in 2013-14. However, given the overall increases in crime levels, questions are raised about the accuracy of these statistics. Commercial crime is notoriously underreported by the public as well as the private sector, because of the associated reputational risk. The dark (or hidden) figure is probably far greater than reflected in the official statistics. Business is finding it increasingly difficult to absorb the direct and indirect effects of crime. The business sector is the main contributor of disposable household income and the country’s revenue base through taxes and levies. The increase in the cost of crime means that less income is available to pay for wages and for contributing to the state coffers. As the criminal threat increases, so too does the spending by business to secure their interests, their staff and the public. Already plans are being considered to improve security at shopping malls. This will no doubt be extremely costly and may even have an impact on consumer prices. In addition, the ongoing targeting of shopping malls and other businesses may also prove disruptive, and could have a dampening effect on the usual festive season shopping and spending experience. 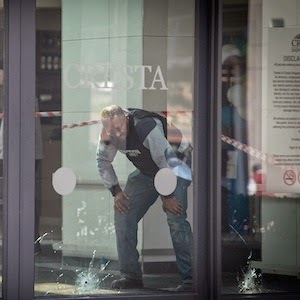 The real concern, however, should be the medium- and longer-term impact that increasing criminal activities and violent protest action can have on business and investor confidence in South Africa, and on tourism.